ABOUT 2.6 MILLION Australians live in the Murray-Darling Basin. Three million get their drinking water from it. The Basin covers 1 million square kilometres and produces $24 bn of agricultural products. With about one-third of our food supply, it is arguably Australia’s food bowl. Six governments have jurisdiction over parts of the basin — Queensland, New South Wales, the A.C.T., Victoria, South Australia and the Commonwealth. 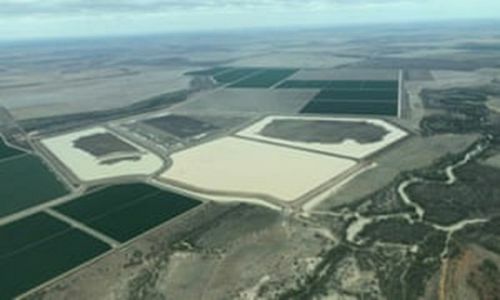 The Murray-Darling Basin Authority and its plan are a carefully-crafted compromise between their competing interests and the competing interests of their residents. It is too glib to say that we should focus solely on the environmental needs of the river system. In the present circumstances, it is too glib to say that we should focus on the triple bottom line – economic, social and environmental – of the river system. They are not separate; they are all part of the warped version of humanity we live under — capitalism. It is capitalism which separates them, and us. The Murray-Darling disaster seems intractable, reflecting the essence of capitalist society and its divorce (or metabolic rift) from nature. The metabolic rift is the idea, taken from Marx that there is an ‘irreparable rift in the interdependent process of social metabolism’. This has created a rift between the way capitalism operates and the natural environment. The relationship is antagonistic, not cooperative. In a nutshell, the problem is profit and the capitalist system that is built on this drive for more and more money. Under capitalism, it is either profit or the environment. As the Murray-Darling Basin experience suggests, (and so, too, the obsession with coal and underwriting coal-fired power stations, the destruction of the Great Barrier Reef, logging and similar activity killing koalas and other animals, the ongoing extermination of species, the record temperatures across the country, or huge fires in the south and once-in-a-century floods in the north, to name a few), it cannot be both. The Murray-Darling Basin Royal Commission has cited gross maladministration, negligence and unlawful actions by Commonwealth officials as just a handful of the failures in its multi-billion-dollar effort to save Australia’s largest river system. The scathing report has gone as far to accuse the Murray-Darling Basin Authority (MDBA) of negligence and being “incapable of acting lawfully”. All this to justify profit by particular groups. The problem is that if under capitalism you ignore the triple bottom line approach – environmental, economic and social considerations – and concentrate on the environment, you end up possibly destroying the current living situation of many people in the Basin. These are the people who work in the agricultural and other industries and the communities surviving because of that activity. How sick is that? It is the logic of capitalism. The system pits the environment against the economic and social if there is a quick buck in it. It is like watching a drug-addicted relative die. They cannot live with the drug; they cannot live without it. 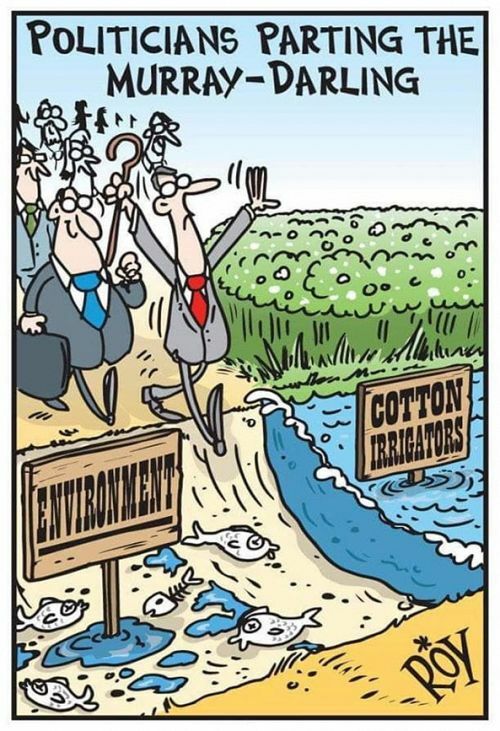 The Royal Commission says that politics determined that the amount to be released into the river to help save it, the Sustainable Diversion Limit, should be set at 2.750 gigalitres (GL) of water, rather than the science which suggested a figure of between 4,000 and 7,000 GL. That much lower figure means more water upstream for irrigators for their crops and livestock and less for South Australia and other sections below those gifted this extra water. Why rice growing exists, let alone receives incredibly generous water allocations, is beyond me, other than that there are powerful capitalist interests and big money behind it. Where big business goes, politicians often follow. It took Rex Patrick, a Centre Alliance Senator for South Australia, to photograph the thousands of gigalitres of water that rice farmers on the Moonie River in Southern Queensland have stored away for their water-intensive farming. I ask again — why are we growing such a water-hungry product as rice on the driest continent? Profit, profit and more profit is part of the answer. So, too, is the fact that individual businesses do not see themselves in cooperation with the rest of business, but rather in competition either directly or indirectly. They win (profit) by destroying, figuratively and, in this case, literally, others. Rice and other farmers do not pay for the environmental destruction they create or contribute to. These “external” costs are ignored in calculating the bottom line. They are borne directly or indirectly by the rest of society. Much like greenhouse gas emissions, or smoking. Is there a solution? The responses to the Royal Commission suggest not. All the sides are digging in, defending their part of the current profit arrangements, even though those current arrangements will likely destroy future flows of profit. Sometimes the state steps in and imposes solutions on capital that are in its longer-term interests. There are no signs the current government or future Australian governments will do anything like this. To impose “solutions” that impact severely on the lives, livelihoods and living standards of millions economically is not a solution. That is not to defend capitalism, but to argue that workers are forced to sell their labour power to survive under capitalism. This means any radical State-imposed changes to the arrangements under which workers are forced to survive could destroy their lives and those of their families and communities. And yet change will come, either under the hand of government or even, long-term, market forces or, more ominously, natural environmental forces responding to capitalism’s destructive bent. This assumes that we see capitalism as natural. The alternative is a society in which we work with nature to produce the goods and services that could make life liveable and enjoyable for all of us on the planet. Such a society can only come about by getting rid of the profit motive and organising ourselves democratically to satisfy human need. This requires a revolution against the established order and their ongoing destruction of our planet. There is no Planet B. 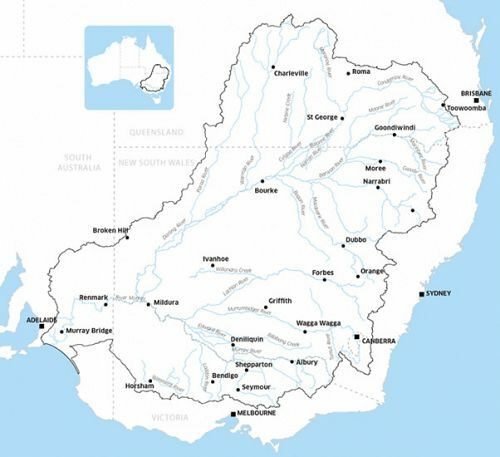 The reality is there is a plan to manage water flows in the Murray Darling Basin to ensure the river stays as healthy as possible and that irrigators are also largely satisfied. The plan obviously needs to be constantly reviewed to take into account actual and forecast rainfall and tweaked, relaxed and tightened as needs dictate. This has clearly not happened. Irrigators drained the water from the Menindee Lakes leading to a toxic algae bloom and the massive fish kill.